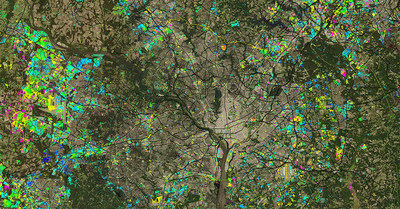 WESTMINSTER, CO, March 28, 2019 /PRNewswire/ - Maxar Technologies (NYSE: MAXR) (TSX: MAXR), a global technology innovator powering the new space economy, today announced an agreement to integrate its NaturalVue® 2.0 image mosaic and National Urban Change Indicator (NUCI) commercial products into ArcGIS Living Atlas of the World. The operations of DigitalGlobe, SSL and Radiant Solutions were unified under the Maxar brand in February; MDA continues to operate as an independent business unit within the Maxar organization. NaturalVue® 2.0 is Maxar's next-generation global image mosaic, encompassing over 60,000 Landsat 8 images. As the highest quality global, commercially available, and virtually cloud-free 15-meter mosaic with current imagery, NaturalVue® 2.0 provides a seamless basemap that reflects the Earth's true colors. NaturalVue® 2.0 updates and improves upon previous versions with enhanced positional accuracy, color fidelity and spatial resolution. Maxar's image mosaic portfolio also includes Vivid and Metro mosaics, which are the highest resolution global mosaics available commercially. NaturalVue® 2.0, Vivid and Metro enable a broad range of geospatial and web-based mapping applications, including military and defense logistics, GIS backdrops, flight simulation, cartographic mapping, 3D visualization and GPS tracking. "The addition of NaturalVue 2.0 and NUCI Esri's ArcGIS Online platform gives thousands of GIS professionals the ability to effectively address complex geospatial problems at a global scale," said Tony Frazier, Maxar's Executive Vice President of Global Field Operations. "Maxar has hundreds of geospatial analysts certified on ArcGIS. The integration of NaturalVue 2.0 and NUCI expands our strong partnership with Esri and furthers our overarching goal to equip our customers with the ability to easily source, enrich and analyze massive amounts of geospatial data to create a decision advantage." "Over 350,000 organizations have access to maps in ArcGIS Living Atlas of the World," said Jack Dangermond, Esri founder and president. "We are delighted to continue our close collaborative working relationship with Maxar by adding its National Urban Change Indicator product and NaturalVue 2.0 image mosaic to Esri's platform." Company Name: Maxar Technologies Ltd.
Financial data for Maxar Technologies Ltd.